Here are a few books I've read (Jack has read many of them as well) – some of which we really enjoyed and highly recommend! 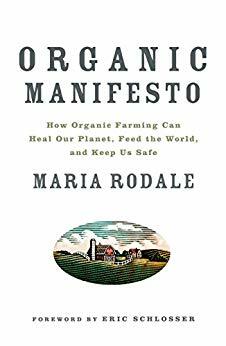 The highly anticipated book from the CEO and Chairman of Rodale Inc.
We all hope to raise our children, the way Nina was raised, on organic food and breast milk, in a lifestyle that connects with the land. Real Food offers some personal anecdotes, but mainly addresses food issues and how to make better choices for yourself and your children. Real Food is intelligent and well researched and offers answers to nagging questions, such as why you should drink whole milk, why is grassfed beef better, why buy organic, and what other types of food we should all be eating more of (e.g., fish, and fermented foods). The tone of Planck’s writing is wonderful and makes Real Food easy to read cover-to-cover. I was pleasantly surprised by this book, as many memoirs are dry reading. The Year of the Goat immediately engaged me. Hathaway’s writing style is easy going and light, which makes it delightful to read. Her writing style reminds me of Ruth Reichl in its grace and accessibility. She has a story to tell, too: A New York City couple leaving behind their old life to embark on a venture that is completely new and exciting. Their pursuit of the goat is worthwhile and enjoyable reading. There is a lot to learn about goats, goat cheese, and the pursuit of farming. Margaret Hathaway and her fiancé cross America looking for answers. They don’t actually get to make their own cheese in The Year of the Goat, but we can hope for a sequel. To be frank, I was expecting another book entirely. The introduction teases the reader that the author’s travels in search of the rare and bizarre and downright dangerous items are the subject of the book, (as the title also infers), and such is not the case. The subject of the book is more of a social history of the attracting item, like bull’s bulls or Swedish Moonshine. The author paints a detailed portrait of the society in which he is thrust into in search of the devilish ingredient, and while he is an articulate writer, he does not have the off-the-cuff bravado of Anthony Bourdain, for example, to make that sociology/anthropology lesson fun. Don’t get me wrong, it’s interesting to learn about the circles which revolve around cocoa leaves and strict Malaysian laws but it was not quite a Devil’s Picnic, but more like a freelance writer’s quest for edginess. The Artful Eater is a collection of articles from earlier issues of his The Art of Eating journal. This revised, second edition, will kick up your food knowledge a couple of levels. Highly recommended. Ms. Prentice accomplishes something rare – she’s made me think again about what I’m choosing to eat. Few food books are this inspiring. I found the title almost misleading; it represented to me something mystical and intangible. Instead the book and it's messages are very down to earth. From Sugar to Eggs to Root Vegetables, the full moons represent 13 “months” of food/growing food/eating in the lunar calendar. From the Hunger moon of root vegetables (winter crops and over-wintered foods) to the Moon of making fat to the Blood moon (also known as the Hunter’s Moon). Each chapter is focused on the “Moon” month and what it means to us in 2006. The Sap Moon deals with sugar and among other things offers a list of natural sugar alternatives like jaggery, palm sugar and birch syrup – all of which I had known about, but after reading the chapter I came away with a better understanding of them. As a result I changed the type of sugar we use in our house. Now if an author can manage to make me focus on something I’ve been taking for granted and call me to action, I think that’s a major accomplishment. This is the second of (now) three autobiographies by Ruth Reichl. This is our favorite. Her writing style is easy-going and fun-to-read. Most of both of these books we read aloud to each other. Parts were hysterically funny. I’ve never tried any of the recipes that are tucked inside, and wasn’t really inspired to at the time, but I loved her stories! A light-style foodie book, that is more narration than storytelling. While Mimi Sheraton’s writing is easy to read and pleasant, the content of the book is rather thin. The book chronicles her experiences pre and post New York Times restaurant reviewer, and although there are tidbits of delectable interesting food stuff scattered here and there the book is more about her and less about food and food writing – so it wasn’t what I expected. Compared to Ruth Reichl’s first 2 books which also chronicle her life – this one is far less passionate – and less satisfying. My expectations were low for this book as I had read most of the cooking and courting saga in the New York Times Sunday Magazine section. I was pleasantly surprised to find extra recipes and longer stories for some of the installments, and at the end I had a compendium of many of the recipe pages which I had torn out of the Magazine section. Based upon the number of recipes I would consider attempting from the book, it was worth the purchase and if by chance you didn't get to read Hesser's courtship of Mr. Latte, you might find this alone worth the price of admission. The author shows his love for pig, pork and hams, and takes the reader into the past, including why some religions and countries banned pigs (or their consumption). But most of the book is about visits to tiny ranches that raise hogs (complete with recipes), and what he learned from them. This is a fun book for those who love pork and ham, but I wish it was more comprehensive, lengthier, and less anecdotal. Kitchen Literacy was not what I expected. The majority of the book deals with the history of the Food Chain. I was only mildly interested in the earlier chapter on the beginning origins of food and the home cook. Later chapters intrigued me more; discussing automation, the evolution of the grocery store and advertising. I was rather expecting to find answers to the ever present problem of getting back to being closer to our food. Still, I found Kitchen Literacy a really interesting essay on the evolution of the modern food supply. It is exceedingly well researched and I marked pages for future reference. The “Notes" pages are extensive and could easily elicit further reading. Particularly fascinating was the note on the discussion of food additives at the turn of the last century. Vilesis’ writing style is easy-to-read and enjoyable and Kitchen Literacy is well indexed. This book would be a wonderful book club choice as it imbues discussion throughout and allows for deeper research. Highly Recommended. The book is part parent's helper (thinking about food) and part cookbook. It is a great book for parents. It not only offers a place to start changing the way you eat (and shop), but breakfast and lunch ideas, plus recipes that are actually plausible. The first chapter outlines basic nutrition, and then puts that knowledge to work in chapters 2 and 3. The last chapter offers resources (a list of great websites) and a policy guide. About one third of Lunch Lessons is devoted to recipe ideas. The tone is not preachy, but concerned, and the authors offer enough information that first small changes are easy to make. I think that Chef Ann’s Guide To Healthy Eating is absolutely great, even for parents who think they know their kids are eating well. It’s like a Standards Guide of what kids should be eating, and suggestions for getting there. She even offers a report card, which would be fun to fill in as a project. I learned that we needed to ramp up on whole grains and fruit. The So-So: Can you find all of this information elsewhere? Yes, and much of it is online. The recipes are more useful in giving an idea, rather than being a necessary recipe. However, the material is presented with tips and suggestions, as well as nutritional facts. The rest of the material is nicely presented and readable, without being heavy in tone or text. The first three chapters are really the “reading” part of the book, so it won’t take long to read it cover-to-cover. Recommended. No Reservations is an odd book. It’s partly a companion to Bourdain’s regarded TV Show, where he travels the world looking for the real meal. The book is more of a photo journal of that quest, with introductions at the beginning of each country, giving an overview of the experiences of Bourdain and the crew. It’s also a bit of an insider’s view of the travel team, from leeches attached to irregular spots, to hangover admissions. No Reservations is a bit too voyeuristic for my taste. However, what it does impart is the depth of profound change that Bourdain feels at the end of the travels and the deep despair of the unlikelihood of being able to share the revelations with another who has traveled that path. The photography, too, has some moving moments. A few of the photos capture the intense beauty and remoteness of the location. One of the chapters near the end offers photos of some of the more interesting dishes from the show. If you have watched No Reservations, the TV show, then the book is of natural interest, but there’s not a lot of reading involved. Dr. Nestle's book is an essential read as it takes you aisle-by-aisle through a grocery store, telling what you need to know about so many items. You'll be amazed at what you learn from this book. The book is aimed at a younger audience, with hope of educating them on the negatives of a fast food lifestyle. It falls short of its mark by aiming too high for most of the younger set, in both choice of material and the language. In more of a textbook style, Chew On This presents a cross-section of the information offered in Fast Food Nation but perhaps more pointedly, attacking Fast Food culture rather than exposing behind-the-door secrets. Too much attention to detail makes it drag and it is likely to bore a younger audience before they get to an interesting part. The first page fails to capture my attention and the second chapter, the history of fast food, which I found really interesting, I’m guessing is less likely to be fascinating to a 13-year-old. Chew On This isn’t written as story, it’s more of a treatise, and while I agree that youths should be respected as adults, this book aims over the heads of those readers it intends to capture – in style – not in content. It’s textbookish and likely that’s the only way most young readers will read it – if they are assigned it. This is a fantastic primer for those wishing to re/visit “real food”. As Vinton describes it, real food is “delicious, produced as locally as possible, sustainable, affordable and accessible.” Under that definition it’s easy to want to eat real food too! The book outlines why you should reconsider your current food choices and offers ways of change which are accessible to anyone, anywhere in the country. Each chapter visits an “aisle” of a pretend supermarket. Covering eggs, dairy, meat, processed foods, etc. Real Food Revival does an admirable job of raising awareness of what we eat, and why and provides it in an upbeat and entertaining way, engaging the reader. If you are thinking about where your food comes from – The Real Food Revival gives real food for thought. A great first book on food. Recommended. Toronto culinary journalist Gina Mallet’s engaging essays on eggs, milk/cheese, beef, vegetables and fish are not only entertaining but tremendously educational. Like Ruth Reichl, Mallet writes in a way that pulls the reader into her story, making it easy to devour the book in a few sittings. (I suggest five.) While the essays are based more on informed opinion than research, the gravity of the message is undamaged; the loss of important artisanal foods in the name of business, and the change in agricultural practices and methods in the evolution of big business. I learned things like a hen in the prime of her life produces 1 egg/day. That the black and white Holstein cows are generally used for milking as they produce a higher yield of milk – not better tasting milk. That there is a movement to ban all raw milk cheeses not just the ones not aged 60 days. She tells us that there is a food Codex which outlines how food products are to be made worldwide. Although proceedings take place in Brussels, this is not just a European project. American representatives, including Kraft Foods employees, play a large role in the decision making.